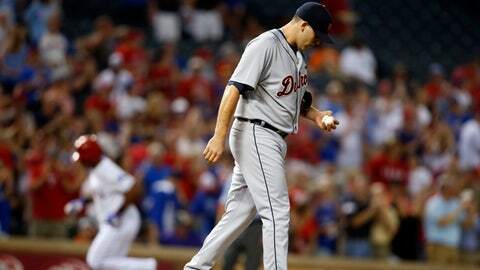 Tigers left-hander Matt Boyd (1-6) allowed all three Texas homers while giving up seven hits in 2 2-3 innings. ARLINGTON, Texas (AP) — The Detroit Tigers go into their final series looking for Miguel Cabrera to clinch his fourth American League batting title in five seasons. That is about all that is left for the last-place Tigers, who finish the season with a three-game series at the Chicago White Sox, the team a game ahead of them in the AL Central. Cabrera went into Wednesday at .334 and with a 10-point lead for the AL’s best average, but didn’t play in the 6-2 loss to the playoff-contending Texas Rangers. "Miggy will get in there at least one game," manager Brad Ausmus said, though he wasn’t sure which game or games that would be in Chicago. Ausmus said the Tigers would play a lot of youngsters in the final series, which has no playoff implications for either team. That wasn’t the case in Texas, where the Rangers moved within one victory of assuring a postseason berth. They open a four-game series at home Thursday against the Los Angeles Angels. Adrian Beltre hit the first of three Texas home runs. Robinson Chirinos and Mike Napoli also went deep for the Rangers. Yovani Gallardo (13-11) allowed nine hits over 5 1-3 innings, but gave up only two runs to win for the first time in his last four starts. The right-hander struck out five and walked one. "We put up some hits. We just didn’t put up runs," Ausmus said. "We didn’t get the big hit, the home run or the extra-base hit with runners on that push you over the edge." Tigers left-hander Matt Boyd (1-6) allowed all three Texas homers while giving up seven hits in 2 2-3 innings. He struck out two and walked one. "My changeup usually doesn’t get hit that hard. It wasn’t the only thing that was hit," Boyd said. "I wasn’t really staying with my delivery. Didn’t have the rhythm like I’ve the past three outings." Texas got even in the bottom of the first on Beltre’s 17th homer, a shot to left-center field. Beltre has an AL-best 29 RBIs in September, and 74 for the season. Chirinos led off the second with his 10th homer, putting Texas ahead to stay. Beltre had a two-out double off the left-center wall and scored on Prince Fielder’s bloop single before Napoli hit a blast to the wall behind the lower deck of seats in left field. Tigers: Victor Martinez missed his second consecutive game with a sore left quad. … 3B Nick Castellanos was back in the lineup after coming out in the first inning Tuesday because of a bruised right finger and sore left wrist.